The maid of honor plays a very important role in a wedding. They are right by the bride’s side every step of the way and available to help at a moment’s notice. That is why the role of the maid of honor is often given to the person who is closest to the bride such as her sister or best friend. It is a great honor to be chosen to be that special someone in the bride’s ceremony. As a maid of honor, you want to come up with a legendary speech that will let the bride know just how much you care. You may be able to come up with a winning maid of honor speech all on your own, or you may get stuck at the beginning because you don’t know where to start. 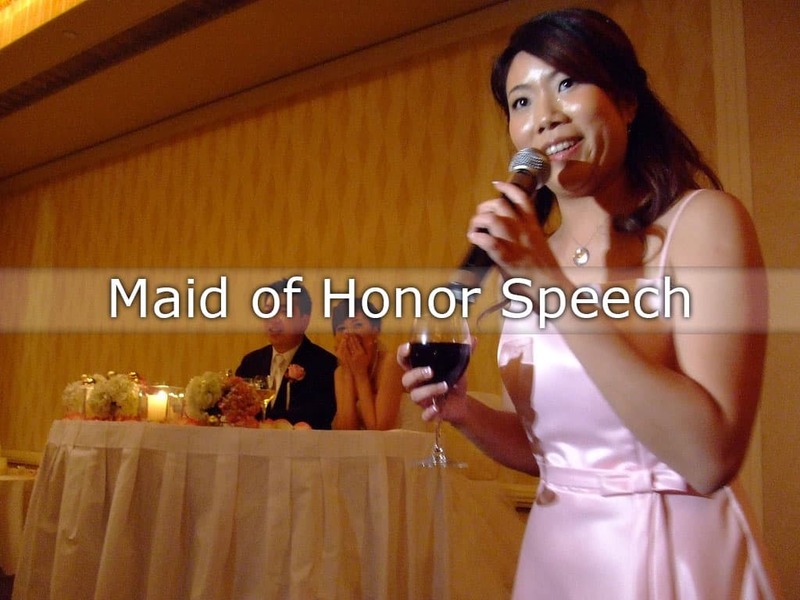 Either way, these interesting and fun ideas for maid of honor speeches can help you get the creative ball rolling so that you can deliver a speech that will make the bride laugh and cry at the same time. It is always a great idea to start off your speech by letting all the wedding guests know who you are and how you know the bride. This is important since many of the people in attendance may not know who you are. It is also a great opportunity to tell the story of how you first met if you are best friends or share a hilarious story from your childhood if you are sisters. Adding a funny backstory to your speech is always a good thing. Just be sure that it isn’t too embarrassing or contains too much adult content which could cause your funny story to go south very quickly. 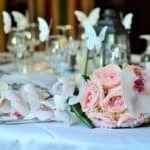 Since all people know how expensive weddings can be and how much time and energy goes into planning, it is a good idea to recognize all the people who helped out with planning the wedding or paying for the ceremony and wedding party such as the parents of the bride or groom and anyone else you feel that the bride would want to send a special shout-out to. This gives everyone a chance to clap and show their appreciation for the beautiful ceremony they are attending. You are there to help introduce the bride to her in-laws since you are the person outside of her spouse who knows her better than anyone else. If you have already shared a funny story about the bride, you may want to add in a touching story where the bride was there for you in your time of need or something that they have done in the past that always warmed your heart. You don’t have to stretch the truth or add in info that isn’t correct. Just share something nice about the bride that you know will make her new family smile. You can start out your speech about the first time you met the groom. This could be a sweet story or a funny story, whichever you think is most appropriate based on the groom’s personality. It will show that you are all friends and let his family know how much you approve of him marrying the bride. Any interesting or hilarious stories about your first impression should be appropriate for your maid of honor speech. Remember the guests will want to hear something funny so it’s always a good idea to add some humor to your speech and choose a funny story to tell about the couple. But if you don’t want to have a complete comedy sketch on for your maid of honor speech, you can always come up with a sweet or touching story to tell about the bride and groom as well. Telling a story about the couple is always a great way to segue into “That was when I knew it was true love.” You are sure to get a lot of smiles from the guests and it will bring back some precious memories to the lovely couple as well. Tell about how you noticed a change in your friend’s attitude or maybe even how the two of them didn’t get along as well when they initially met. You are sure to share some details that a few of the guests may not be aware of and that will help make your maid of honor speech a success. It may not work for every maid of honor speech, but if you have the opportunity to use a prop, you definitely should take advantage of it. Using a prop for a wedding speech can go very well with the audience if it ties in well with the main idea of your speech. Some of the best props that you can use include childhood photos, slideshows, home, movies, or unexpected items such as a favorite childhood toy. A prop is not something that should be forced into your speech so if you don’t think it will work with everything else you have planned, you should probably just leave it out. But if you come up with a prop that you think will win over the audience and bring back fun memories for the bride and groom, then it will definitely help you turn your maid of honor speech into something that is far more memorable than it would have been without it. If you are stuck on how to start off your maid of honor speech or how to end it, you can use a popular love quote, phrase, or a poem to help you get the ball rolling. You can use a quote from a favorite book or movie, a line from a TV show, or a snippet from one of Shakespeare’s plays. No matter what you choose, just be sure the bride will approve. A great way to get everyone involved in the speech portion of the reception is to add an interactive component to your time on stage. You many want to ask the audience a question at the beginning of your speech and start off with “Raise your hand if…” or “How many people here…” and then add something funny or relevant to the bride and groom at the end. If you choose to go this route, it is a good idea to have a few people in the audience that you know will play along if it seems like others do not want to participate. They can help to encourage other members of the audience to answer the question and join in. Adding a question to the end of your speech could be something simple that will get them cheering and excited for the rest of the reception such as “Who is ready to celebrate this couple with an awesome party?” It will help add more excitement to the room and get everyone in a great mood. You may have a ton of great ideas for your maid of honor speech or you may not have anything at all. Just remember to keep the speech short and sweet because while your intentions are sincere, you are taking to a large crowd of people who are anticipating music and food. It’s okay to tell a funny joke or two about the bride or even tell something that is a little embarrassing to get a laugh out of the audience. But don’t make your entire speech a huge roast for the bride or the groom for that matter. You could end up offending some of their family members or even making the bride angry in the process. Keep the embarrassing facts to a minimum, and you shouldn’t have any issues with stepping on toes after the speech is completed. If you are nervous about giving the speech, the good thing is that you don’t have to make it last long. Give a few fun details about the bride, tell a funny story or two about the couple, talk about their childhood, add in a few touching details, and then you are ready to let everyone go to enjoy the rest of the party. Your work is done, and it will be a moment that the bride will remember and cherish for many years to come. Will You Use These Ideas for an Upcoming Maid of Honor Speech? There are some great ideas for writing a maid of honor speech mentioned here. But the most important thing is to stay true to the bride and write the speech from your heart. Think about how much you care about her and how much it means to you to be named her maid of honor. By doing this, you should write a speech that everyone will enjoy.